I have a little room, about 8 feet by 9 feet, but it is nice and cozy. 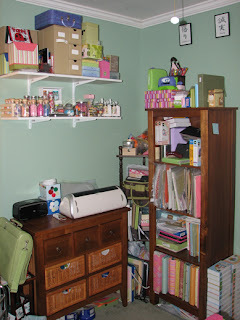 I have various storage for my scrapbooking supplies. I just pick them up when I can get a good deal and if it will work in the space in the room that I want to put it. This first picture is of my main work area. I have a desk and a little folding table in an 'L' position. It makes it easy to work on a project on one surface and to have the extra space to use my paper trimmer and other tools. The second picture is a little wooden shelf that I store a lot of my most used stamps and other tools. 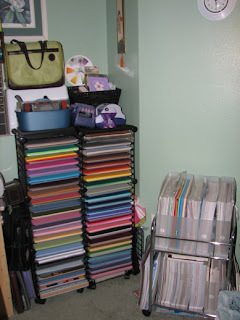 I also keep my pictures and most of my small embellishments in the cropper hopper storage on top. I have some storage on a little built in shelf above the wooden shelves. I have my ribbon storage on top of that. I also keep my cuttlebug stuff up there, too. In the third picture, I have my paper storage. I have found the black paper storage shelves at my local Michaels. It keeps my cardstock nice and straight. I keep my loose patterned paper on the top of the cropper hopper cart in the vertical paper holders. I have my stacks of patterned paper on the bottom of the cart. With this last photo, I have my door that I keep my punches and close at hand tools and embellishments in a hanging craft organizer. I also keep my scrap tote handy here because I go to crops at least once a month and leave some of the smaller supplies in it that I take to all of my crops and use all the time at home. Above that (sorry not a full photo of it) I have a couple of plastic magazine holders that I got from Walmart and altered. 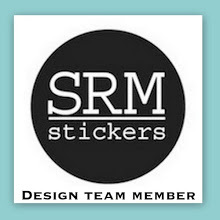 I have my stickers and rub-ons in two separate ones hanging on the wall to the left of my desk. I hope that you enjoyed this tour of my room. If you have any questions, please let me know. I have a few projects in the works and I will post them when I get them done. 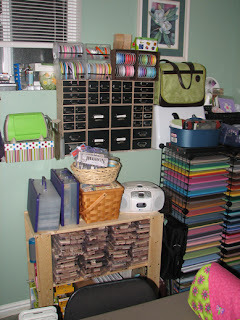 If you want to free up some space in yoru scrap room... try storing your ribbon on ribbon rings. You could hang a coat rack on your wall and hang each ring by color. Just an idea! Take a look at them at www.ribbonring.com! Love this space, very nice. I don't have a space like this, but I sure need it. Have a great day. Love your ideas. 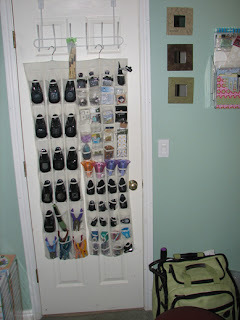 Good ideas and organization! In the second photo, is that the organizer from QVC? 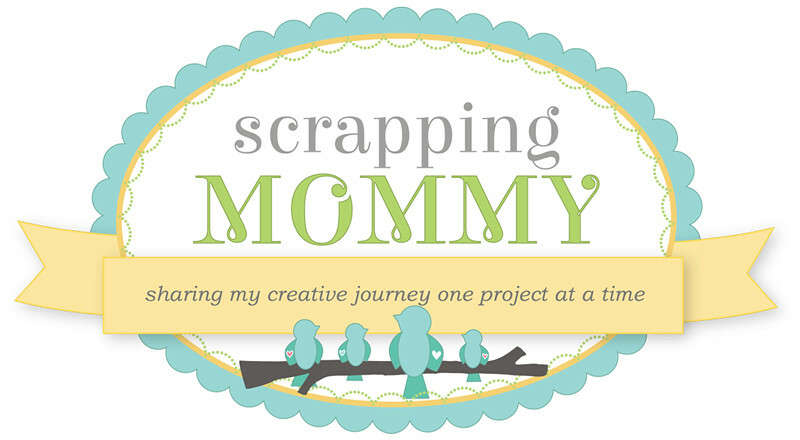 Your room looks very "scrapbooked in" ... I like that! Hi and thanks for the comments. Kopperhead, yes, the black and tan organizer is from QVC. 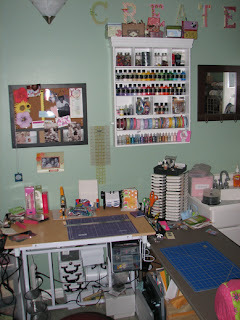 Thank you Amy, I saw that organizer on QVC and wondered how it functioned in a real scrap environment. I like it! Cute cute room Amy! I love your new profile picture! Such a cute family! WOW!!! What a great space!!! Looks like you can get a lot of stuff done in there! !